Spring is coming to a shop window near you and it’s colored pink and grey this season. Note to self, knit something in pink or grey to lull me into believing that spring is here despite the winter weather that keeps hovering over the New York City area. To this end, I bought some Malabrigo lace weight baby merino at Annie & Company on the upper east side in a lilac linen. 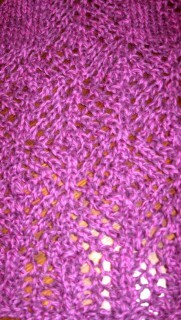 It’s a pale purplish pink and will make a wonderful wisp of a scarf while keeping my neck warm. Inspired by the Knitty Citron scarf that I made my mother out of Spirit Trails Lace Weight Merino, I am going to make a short oblong scarf by knitting sideways. To this end, I made a small swatch to determine the needle size and a guess estimate of stitches. Once I’m finished, I’ll write up the instructions so that you can give it a whirl yourselves. I love the feel of the yarn it’s soooo soft and relatively easy to see for a laceweight. The unpplied strands can vary in thickness. The ruching gives a see through quality to part of the scarf. Since it’s essentially a stocking knit stitch, it’s a great small carry around project. Stephanie Japel’s Frost Diamonds Shawl was one of the Winter 2009 Knitty pattern that I wanted to make. The Frost Diamonds shawl pattern is intriguing since Stephanie Japel applied her skill at making fitted clothes to a triangular shawl which is generally held in place with a knot or a pin. To get similar dimensions and better understand the concept, I bought 3 skeins of Cascade Quarto in magenta and purples at Knitty City’s Birthday Sale because I needed worsted weight yarn which I didn’t have in my stash. While I had hoped that the colors of Cascade’s Quartro would create a more lively pattern, I am impressed with the quality of the yarn. This was my first purchase of Cascade. Pattern is well written and charted. This is an important factor for any lace project. Pattern builds from four distinct sections and each one grows organically. For a lace pattern, it has a lot of stockingknit stitch which can be good for beginning knitters. Pattern’s lines flow very nicely aided by the worsted weight wool. In other words, the lace portions and the section dividing stitches create strong continuous lines that are difficult to discern at first. My husband has been longing for another pair of hand knitted socks ever since I made him a pair, affectionately known as the Verona Socks since I started knitting them on the train from Venice to Verona on a trip that we took in 2006. Since I must be one of very few knitters on the planet who doesn’t like knitting socks, it took me a year to finish them. When one of my UWS Knitting friends showed off her Hiya Hiya 9″ needles which meant that I could knit a sock without loosing track of four doublepoints, I decided to try again. I bought a pair of size 0 needles at Knitty City to go with the gorgeous blue, green and purple Art Yarn sock yarn last August. Then I waited for inspiration. As I noted earlier, socks are not among my favorite knitting projects. Since I have been working on a lot of smaller projects, I decided that the time had come to start a pair of socks for Mr. Husband in hopes of having a birthday present for him before his birthday (which is the end of March).The pattern for socks made with the 9″ Hiya Hiya needles calls for more yarn than the two skeins of Art Yarns, which run a scant 191 yards each. So I dug into my stash where I had a skein of orange, light blue, brown and white sock yarn that Mr. 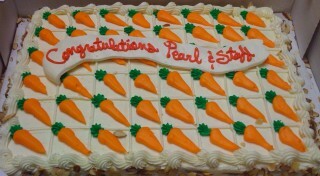 Husband picked out in July 2008 on one of our Webs stops. Within less than 10 rows, I found that my hands cramped using these small needles. Instead of abandoning the project, I changed to my yellow size 0 Pony double points which are flexible but not slippery. I also changed patterns since I wasn’t using the Hiya Hiya needles. Instead, I’m using the Yarn Harlot’s Sock Recipe which allows flexibility. I’ve measured my husband’s calf and swatched to ensure that this sock actually fits when I’m finished. I had put off using this yarn since I didn’t like it (Note to self-Don’t buy yarn that you don’t absolutely love!) but I have found that I really enjoy watching the pattern evolve as I knit. 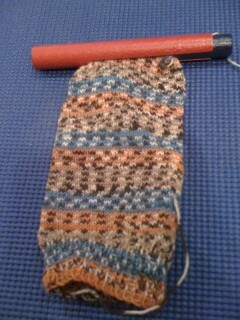 I am using the Yarn Harlot’s Sock Recipe with just plain stocking knit to let the pattern grow. Despite 4 tiny needles, I am able to knit it on the subway. The pattern attracts attention. With luck, it may be a sock before Mr. Husband’s birthday. I wanted to make a pair of fingerless gloves/gauntlets this winter. To this end, I bought one skein of magenta organic merino at the Lion Brand Studio. It’s a limited edition yarn targeted at fancy yarn snobs with limited budgets. The $8.00 a ball yarn contains 300 yarns and can be used for a wide variety of projects. While I’m concerned about how the yarn will wear as a pair of fingerless gloves, the project is relatively inexpensive for quick-to-make, one season accessory. After perusing Ravelery, I discovered that there were many, many options for knitting a pair of fingerless gloves. I prefer to call them gauntlets because it congers the image of a romantic medieval knight kissing my hand. I quickly fell for the Nereid Fingerless Gloves which are based on Cookie A’s Pomatomus Sock pattern from Knitty. I liked the lacy fish scale lace pattern. While the organic merino’s label calls for a size 6 needle, after several swatches, I found that I needed to use size 1 doublepoints to get the pattern to work. In addition, after several rows of knitting, I needed to restart the project by eliminating one pattern repeat or the gloves would have been way too big. 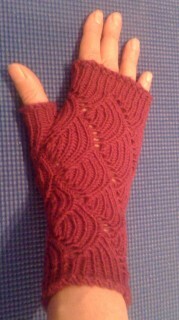 One less set of rows to make the gauntlets slightly beyond wrist length. They fit under a jacket without any gaps. Reduced the thumb stitches by 2 to keep the thumb tight enough. I love the gauntlets. If I were to make them again, I would make the portion above the thumb shorter since it gets in my way when I work. I made these fingerless gloves specifically to knit on the subway. My first purple mobius cowl came out very long and skinny since I cast on many, many more stitches to adjust for my smaller needles. I used 40 inch size 4 needles. Unfortunately, using a mobius cast on is impossible to measure effectively as you would a flat piece of knitting. The original cowl wrapped around my neck about 3 times when finished and quickly grew to over 4 times. As it kept growing, I wondered whether my neck was going to grow to allow more room for my ever-expanding cowl. The loop went below my knees when unwound. At that point, I re-read the instructions and realized the error of my ways. The cowl used larger needles since it was knitted using double strands. Since I loved the rich purple silk-merino Malabrigo that I bought in Alexandria, unwound the cowl. Having worn it made it difficult to unravel since the yarn had pilled slightly and my bindoffs where difficult to find and undo. 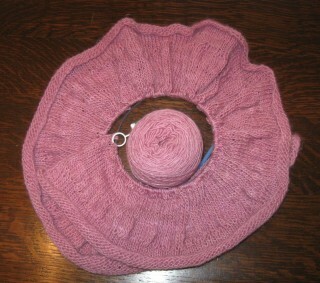 Check out other knitters’ experiences on Ravelry before starting to knit. Be willing to take apart an item, regardless of how much work it involved to have a better finished result. Based on my experience, I am glad that I had the willingness to rip it out. It helped that I loved the purple Malabrigo! What do you do in such a situation? Do you keep your piece intact and just move on or do you rip it? 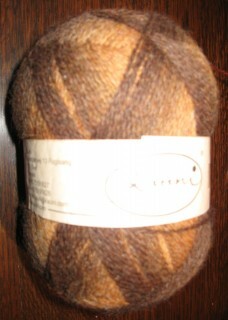 One of my two stash-enhancing purchases made at Stitches East 2009 in Hartford, CT was a 160 gram ball of Kauni yarn in browns and golds. Hidden from view are the orange and maroon variations that come out of the ball like a magician pulling one scarf after another from his assistant. The endless balls of Kauni displayed in a wide range of color options at Stitches were truly eye candy for every knitter. While I chose the brown-gold variation since it looked good with my skin tone, my friend Delia who I owe a special gift immediately fell in love with it when I showed it to her. It coordinated perfectly with her brown suede winter coat which was in need of a wonderful neckwarming wrap. Now to be honest, Delia wanted an Infinity Scarf like my pink one. In good faith, I started knitting a lovely lace variation of the Infinity Scarf but after 3-4 repeats (of over 200 stitches), I worried that there wouldn’t be sufficient yarn due to the way the yarn was knitting and that it would be difficult to block. 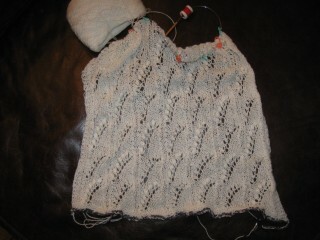 (Of course, in retrospect, I should have knitted the piece as a long rectangle, blocked it and sewed it together.) So off to the ball winder went my first effort. At this point, I decided to use the Revontuli Shawl pattern that I got with the yarn because I was sure that I had sufficient yarn to make the shawl. My friend Delia will have to wrap the finished object to look like an Infinity Scarf. Plus, she will have the option to use it as a shawl when it’s warmer out! The revontuli shawl is a relatively easy lace pattern. This makes it a good way to ease into lace knitting. The most difficult stitches are the left and right pointing increases at the beginning and ending of each pattern repeat. Alternatively, it can be your relatively-mindless knitting. The revontuli shawl has a wonderful fan shape with points to it which varies from the run-of-the-mill triangles. As a result, I started my Revonluti with gusto since I needed a project that I could throw into my pocketbook and take with me. I would like to give a tip of my hat to my UWS Knitty buddy at Snit ‘n Knit for her initial inspiration on this pattern. Since eliminating UFOs is on my 2010 Knitting Resolutions, I took a deep breath and spread out all of my WIPs on my bed. My goal was to face up to the fact that there were just too many knitting projects that for one reason or another were still in process. The weather changes so that it’s either too hot or too cold to be knitting with the material involved. The knitting you’re working on requires endless amounts of stockingknit or other repetitive activity so that you’re unable to knit another stitch due to boredom. The pattern requires concentration away from other more enticing projects. For reasons beyond your comprehension, you need to rip back more rows than you can face in the present moment which somehow stretches on into years. The event that you were knitting the piece for happened sometime in the past and you’re not sure what to do with the finished article if you were to get the motivation back to finish it. You have nicer, newer patterns and yarn to conquer. To put as many of these once exciting projects off of my to knit list, I assessed each one for the following to determine if there was even the remotest possibility that I might pick them up again. Is the project in a color that I like? Is the project a style that I would currently find fun to wear? Is the project something that is close to being finished? Would the yarn be more appealing as another item (for me or someone else)? Are there sentimental reasons for keeping the unfinished project? If I answered yes to any of the above, I kept the project on the needles. Otherwise, it went to the yarn winder to live another life as something wonderful. While I openly admit, this was a difficult process. There were projects that I had started with good intentions like the first of my wedding shawls, but I was never going to finish them. So, I rewound the yarn and hope to make something wonderful out of the recaptured yarn. I must admit that once I finished doing this I felt a sense of freedom. It’s like the unfinished pieces were literally tying me down. How long do you let your unfinished projects languish before you unravel them? My friend Kathy joined me for a NJ bound yarn adventure to Silk City Fibers in Paterson for their monthly warehouse sale which is open to the public. We used the instructions on their website to drive there and found it very straightforward compared to Mapquest. To entice winter shoppers (like die-hard knitters need to be proded to enhance their stash), there was coffee served in beautiful hand made mugs and donuts. Since my last visit, they had rearranged the warehouse area, there were wonderful goodies to be had. This month, there was a special on merino which came in royal blue, camel and a tomato red. Each cone was roughly 2-3 pounds of a sock weight yarn. My friend Kathy and I snagged the last two cones of a light grey. I am planning to use it to make a circular shawl, perhaps one of the Marion Kinzel patterns. There was an array of cashmere in different finer weights and an 85% silk/15% cashmere blend in a beautiful mauve, light blue and beige. I bought a pound of a fine twist of cashmere in a wine color that I plan to knit either three strands or four strand together. As always, there are boxes of mill ends where I find interesting things. This time I got two small mill ends of a pink and a mint green cashmere. I am hoping that they match the ones in my stash that I bought on an earlier trip. There was also wonderful wool chenille in a lavender, steel blue and beige which my friend Kathy bought. I seriously considered it but I have stayed away from chenille since it tends to worm (unravel). There is a postage scale in one of the rooms where you can weight the cones of yarn to get an idea of quantity. We kept weighing our various selections to determine how much each contained. It’s not that I am an expert. 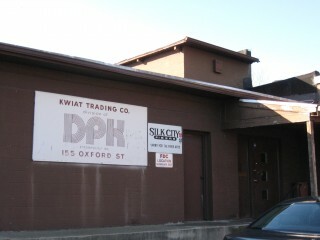 The manager can give you an estimate of yarns per pound and from there you need to take a swag. I have seen women test knit a bit of the yarns to see if they like the look. I must have the air of someone who understands the fibers since a woman kept following me to ask my advice on what to make with various materials and how much to buy. As readers know, I am big fan of Silk City Fibers. It is not a place to go wanting to buy yarn for a specific project unless you have seen the sale announcement and know their wares. Nor should you venture to Silk City Fibers if you only like nicely pre-packaged yarns in even skeins. It is a place where you can get some fantastic buys but you have to be willing to test the materials and let it tell you what it wants to be. It’s always an adventure and what I get is always wonderful for the price. I like to leave wanting more since I can always return the next month when there will be a different variety of yarns. 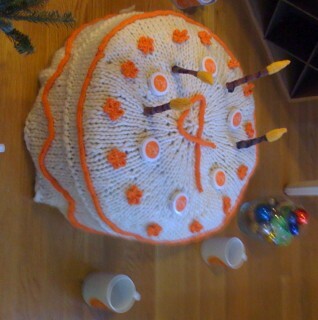 Happy Birthday Knitty City! 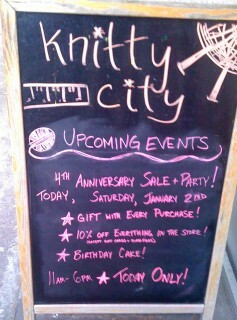 To celebrate its fourth year, Knitty City had a sale and a party complete with cake, both the edible version and the knitted version. The store was crowded for the occasion since there was a 10% sale on everything on the sale. While this may not sound like a large discount, it covers everything including needles, bags and books. Additionally, every purchase received a free Knitty City mug. Four years for a local merchant, especially in New York City blocks from another long time yarn store, is a major accomplishment before you consider the difficult economic market. At the heart of Knitty City’s success is Pearl, the owner. She is friendly and helpful with a great memory for faces. Since the store first opened, she’s been willing to help knitters and help build a community. She will even order needles and other items If Knitty City doesn’t have them. She keeps a broad array of yarns to fit every pocketbook. An incredibly helpful and knowledgeable staff patiently help knitters through complex and not-so-complex knitting challenges. Knitty City has a great library of pattern books and magazines including some in German and Japanese. Further, Knitty City has a regular schedule of speakers, activities and a book club. BTW, Many notable knitterati have been sighted there, some of whom live in the neighborhood. Of course, I had to support my favorite LYS by buying yarn. I had my eye on some Cascade Quarto in magenta and purples to make Stephanie Japal’s Frosted Diamond Shawl in the Winter 2009 edition of Knitty. Despite my regular visits to Knitty City, I still went through the entire stock. I added a ball of Zauberball from Schoppel Wolle in reds, oranges and yellows. I have been intrigued by this yarn since I saw it at Stitches in October. This visit was a real treat since I persuaded my mother to join me. While she still knits, unlike me, she hasn’t been bitten by the ever-present need to enhance her stash. She spent the time on one of the few available chairs perusing the magazines. BTW, Knitty City has changed their shopping bags to help knitters. They are clear plastic which zips closed to protect your precious yarns from bugs and dirt! If you live in New York City or are planning to visit, Knitty City is a must on any knitter’s list of stores to visit. Happy New Year. May your year be filled with love, health and lots of wonderful knitting! Last year, I made some very ambitious knitting resolutions among were joining Ravelry’s National-Knit-a-Sweater-a-Month. 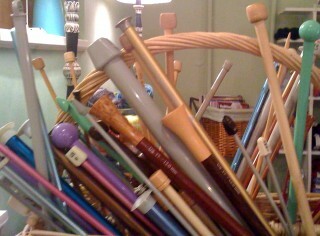 I thought that these knitting goals would help me to up my knitting game. Instead, I felt pressured to knit which hindered the joy that my hobby brought me. That said, I am proud of some of my pieces, in particular, the Hemlock Ring Blankie which was my first major circular lace piece, the Fuschia Nightsong Shawl which was my first beaded piece, and the Klimt Wedding Sweater, which is a wonderful piece of one color patterned knitting. For 2010, I have promised myself to keep my goals more reasonable and accomplishable. One circular lace shawl for me. I am thinking of using the Spirit Trail Fiberworks yellow and brown alpaca laceweight or the brick red cashmere and merino blend. Four sweaters for me – Two long sleeve winter sweaters and two summer sweaters. Since I like the way that my sweaters fit, I have stopped buying machine made sweaters and knit tops. It’s important to keep replacing the ones that I have since they wear out. One pair of socks – Mr. Husband has been patiently waiting for another pair of socks. He loves the way that they feel. For me, socks are in a category with long rectangular scarves, I find them boring. I think that I need to get over this block this year. My friend Amanda has pushed me to add this hurdle to the list. One dressy sweater for my mother. My mother can be very difficult to buy for. Fortunately, she dropped a not-so-subtle hint that she would like another sweater this year. Reduce stash. While for some of you, this may mean no yarn purchasing. For me, this means being careful in what I add to my stash and to work to reduce the overall stash through the creation of wonderful objects. Attend Maryland Sheep and Wool Festival and New York State Sheep and Wool Festival. These events have become fun annual events that I participate in. Reduce UFOs. Unfortunately, as one project nears its completion, I am poised to cast on three in its place. The goal is to eliminate UFOs since they take up brain space. Enjoy the knitting process and continue to share knowledge and friendship both online and in person. What are your resolutions? Are you pushing yourself to complete more projects or learn new skills?